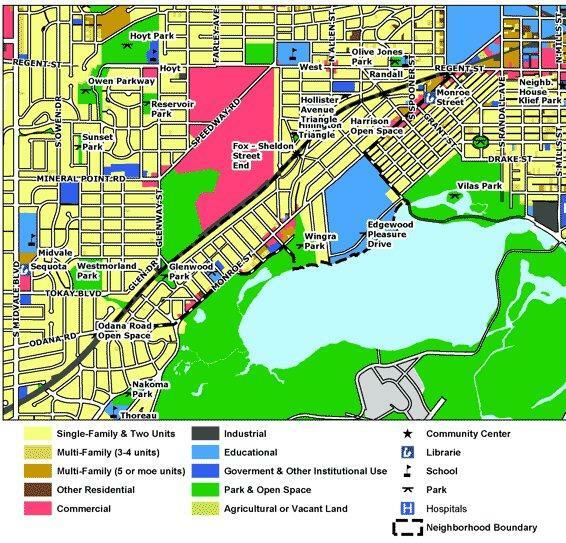 One of Madison’s greener neighborhood’s and proud of the fact, Dudgeon-Monroe encompasses the Monroe street area with two separate small business centers while bordering the UW Arboretum and Nakoma Country Club. Area residents are found out and about exploring and appreciating all the features of the neighborhood. There is a very active neighborhood association that has created self guided tours and treasure hunts which allow any interested resident to learn more about the area. A lazy Sunday afternoon can include a short walk to the farmers’ market at Edgewood, Trader Joe’s or to Wingra Park where one can rent paddle boats, canoes or sail boats and enjoy the water. The bike path allows direct access to the State Capital as well as Madison’s near west side. There is a strong business association that promotes Buy Local initiatives and is a place not only for area residents but a popular destination for all of the City of Madison. The many locally owned unique retail shops, cafes, restaurants and taverns offer entertainment and shopping while leaving your car at home.